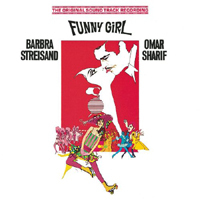 Film Soundtrack, 1968 (Columbia/Sony) (2 / 5) It took only four years for Barbra Streisand to become BARBRA STREISAND, and Funny Girl suffered for it. Tongue-bathing every note and going all-out brash may have helped net Streisand an Academy Award for her performance as Fanny Brice in the movie version of the musical, but it sapped her portrayal of color and character. There are drastic changes to the tune stack, with some of Styne and Merrill’s best work cut. Replacements include two old songs associated with Brice, “My Man” and “I’d Rather Be Blue”; and some new numbers written by Styne and Merrill, including the lame “Roller Skate Rag” and “The Swan,” plus a superfluous title song that has no heart in it. The film is notable for the almost complete absence of any singing by other characters; we hear only little bits from Kay Medford, back as Fanny’s mom, and Omar Sharif as Nicky Arnstein. But the main problem is that Streisand’s bottomless self-indulgence is given full rein here. Although her fans probably love it, I find the heartfelt emotions she summons on the original Broadway cast recording eminently preferable to the affected, manufactured emoting she does on the film soundtrack. 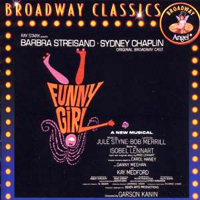 Strictly in terms of vocal quality, Streisand probably sounds better on the soundtrack than on the Broadway album, but the mile-thick shell of artifice is very off-putting. — M.M.